Learning to Sew Part 1: How to Set Up Your Sewing Machine | Do-It-Yourself Advice Blog. 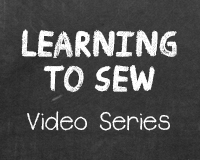 Welcome to the Learning to Sew Series! We invite you to sew through this 7-part video series with us and learn some basic sewing techniques. Made with the beginner in mind, these videos will walk you through all the fundamentals from how to set up your machine to sewing basic stitches. At the end, we’ll put all the skills together and sew a pillow with a zipper! Throughout the series we will be sewing on an Ultrafeed LSZ-1 Sewing Machine. However, the skills featured in the series apply to sewing on any machine. Some features may be Ultrafeed specific, but you can refer to your sewing machine guidebook for specifications on your particular machine. Today, we’re going to start at the very beginning and get familiar with our sewing machines. You’ll learn the parts of the machine and their functions, how to wind a bobbin and how to thread the machine. Join us tomorrow for Part 2 in the Learning to Sew Series: How to Stitch. We’ll be posting the next part in the series everyday this week so be sure to check back for the next part or subscribe to the blog to get new posts right in your inbox. A #22 needle should be good. Heavy Tenara is constructed from multiple strands of monofilament Teflon threads and this makes tensioning the thread rather difficult. It’s typical to see the bottom thread knots sitting on the bottom side of the fabric (they seldom pull into the needle’s hole). So, instead of trying to balance tension by looking for the knot to be buried inside the needle hole, look for a tight stitch on the top side and bottom side of the fabric . You may need to reduce the bobbin tension so the thread pulls off the bobbin with a slight tug. It might be nice if you’d give a little bit of “why” information along with the “how”. For instance, why, when you put the thread on the bobbin, do you move it into the slot and ALL the way across to the other side? I know the answer — it’s because the spring that it’s trapped beneath is what keeps tension on the bobbin thread, and if you don’t move the thread past the little “hook” in the spring, it tends to wander back to the front and get looser. But if you mentioned things like that, then those of us who work from understanding rather than memorization would never forget them. It’d also be great if you had a “more advanced set up” session dealing with things like how to set the bobbin spring tension (my own answer: usually, don’t touch it. But if you HAVEto, make it tight enough that when you hold the bobbin thread and let the bobbin dangle, you can gently bounce it up and down a bit and have the bobbin gradually drop down lower. Any tighter is bad. Looser leads to a mess) and how to deal with threads like Tenara, and perhaps even something about how to thread some other kind of machines like an old Singer, and how to wind a bobbin on an industrial machine. John, your post is a year and a half old, so naturally I have no idea whether you still follow replies to it or not. The best way to learn anything about a sewing machine is to do something, watch what happens, and then remember it. Change the parameters of what you just did, and remember the new result. There is no substitute for experience, but you can get a lot of experience and learn a lot, in a short period of time. Do something, stitch a sample line of straight stitches and see what happens. I’ve been sewing for 55 years now (I am 61) so I know this for a fact. If you have an old singer, get online with the model information (I sewed for 30 years with a Golden Touch and Sew) and the manual will be there, with a threading diagram. A lot of tension things with machines is just experience. There will be some tensioning issues that never resolve–they are caused by your machine + that fabric + that thread. You may have an old singer, but I never, and I repeat never, sew with any machine nowadays that does not have a walking foot, except the sailrite due to its heavy crankshaft. Old singers predate home machine walking feet. The sheer weight of the components of a sailrite machine hold that fabric in place, other wise, you must have dual feed for consistently good results. Best to you in your sewing journey. Pingback: Learning How to Sew Series Part 5: How to Sew a Zipper | Do-It-Yourself Advice Blog. Pingback: Learning to Sew Series Part 6: How to Add Piping | Do-It-Yourself Advice Blog. Thank you for putting together this series, I learned a few things that have helped me out. One thing you mention a couple times in your videos is to select the proper needle and thread for the weight of the fabric, this could be another video in the series as I’m not always sure I have the right setup for what I’m sewing. That’s a good idea, Jeff. In the meantime, our Thread & Needle Recommendation Guide gives suggestions for which thread and needle combination to use with all of the materials we carry. You can find that guide in the documents section on any fabric or thread at http://www.sailrite.com. Thank you for the very perspicuous presentation of learning to sew. I have had an LZ1 machine for over 10 years and I still always learn something from your videos. Grant has an easygoing way and explains everything in an easy to understand way. I just wish my stitches would come out as neat.